The photo above was taken at the island Tiri Tiri Matangi. 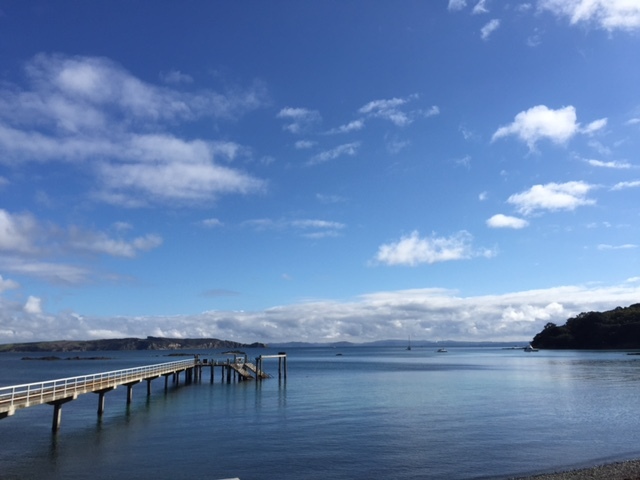 It’s a magical place, in the Hauraki Gulf and accessibly by a ferry from downtown Auckland. Going there feels special because you can only approach it by boat, and only a few people are able to stay each night. It also feels like one of Auckland’s many well kept secrets. The last time I went, the day I took this photo, it was the middle of the New Zealand winter. In some of the photos, we’re wearing shirts and t-shirts and the sun shines strongly. It really is a tropical paradise. There are so many beautiful, special parts of New Zealand, of course. But there are some dull, and some impoverished, and some very highly populated and some quite basic parts of our fair country. It’s paradise of course, but views like those at Tiritiri Matangi are special, and not the norm for most people. It’s always interesting to reflect on home as you travel far, and in our travels to Europe, ‘New Zealand’ seemed a magical, wonderland to some. Somewhere almost too far away to imagine, where perhaps it was like England but different, an upside down land on the other end of the world. I had to politely correct a couple of people who thought that we must all have mansions over looking the sea. Pure New Zealand is a fabulous marketing campaign, but marketing none the less! We have our own troubles, I thought, as I explained what life in NZ was like. Yet our problems seemed to pale into insignificance the day that we stood tooth to jowl, with a group of Syrian emigrants on a packed train to Copenhagen. We boarded the train in Hamburg in plenty of time, a bit unsettled from a rushed journey to Hamburg and sad to have farewelled friends. We quickly tried to find some unreserved seats, as we had tickets but not seat reservations. We found two seats, hauling our two large suitcases and backpacks to a space near enough to us. Then 10-15mins later were asked to leave as the owner of the seats had turned up. We shuffled down the train, found a seat, settled in and where then moved on again. We ended up, outside the train toilets, clutching our suitcases, and beginning to feel that it was going to be a long five hour journey to Copenhagen that day. The train was packed, with about 25% more people than there was seats. Those also standing and seated near the toilets looked different to us – like they were in an entirely different life space. It wasn’t as simple as hair or skin colour. It was the difference between travelling for a holiday, like us, and having undertaken a kind of journey that I can’t even begin to imagine. The day we were travelling was the last day before Sweden brought in border controls, and the train we were on terminated in Stockholm. We disembarked in Copenhagen, and the train journeyed on to Stockholm.